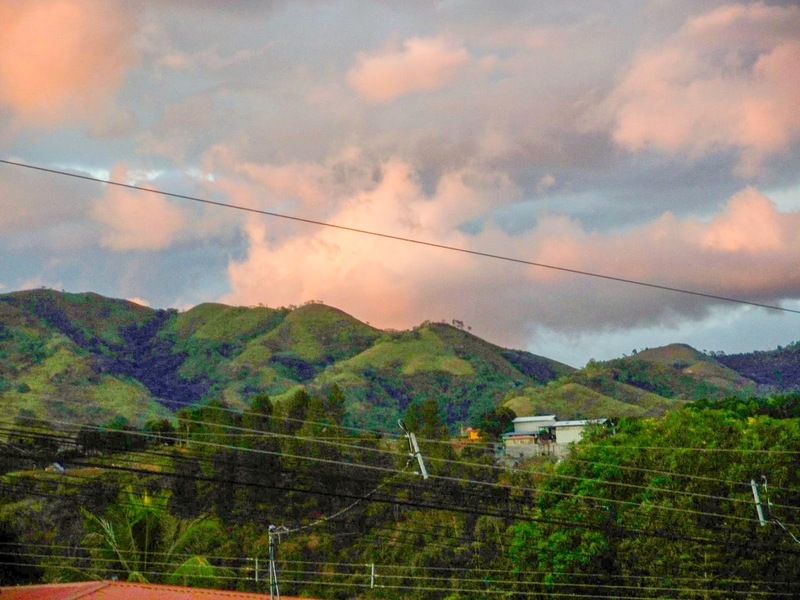 This is "my" mountain... the one that we could see clearly from the living room window of our first house here in our small town in Costa Rica. It is the same one that I could see from the corner of our front porch in our second house, and, when I needed some soul refreshment, the one that I could see in all of its majesty by walking past the mango grove and to the end of our street. Every Sunday, we drive out of town towards our church, down one steep mountainside, over a one-lane bridge, and then up to the neighborhood where our church building is currently located, at the foot of this beautiful mountain. For me, this mountain has been a steady landmark -- one that I can find on the horizon to get directions straight in our little town where there are no addresses and very few street names. Seeing it helps me know where I am, as well as give a reminder of our church family, the reason we're here. While I loved this verse in my college days of spending summers in the Colorado Rockies, it first became a great encouragement to me when my husband and I were newlyweds and were in Guatemala City. I was overwhelmed by the poverty that was so prevalent and by the crime and real danger we were exposed to there. I found myself crying out to the Lord, "I don't know if I can live here!". God gently reminded me to lift my eyes, not just to the beauty of the volcanoes and mountains surrounding the city (which were so easy to not see when overwhelmed by what we were seeing on the streets! ), but to Him, my help. 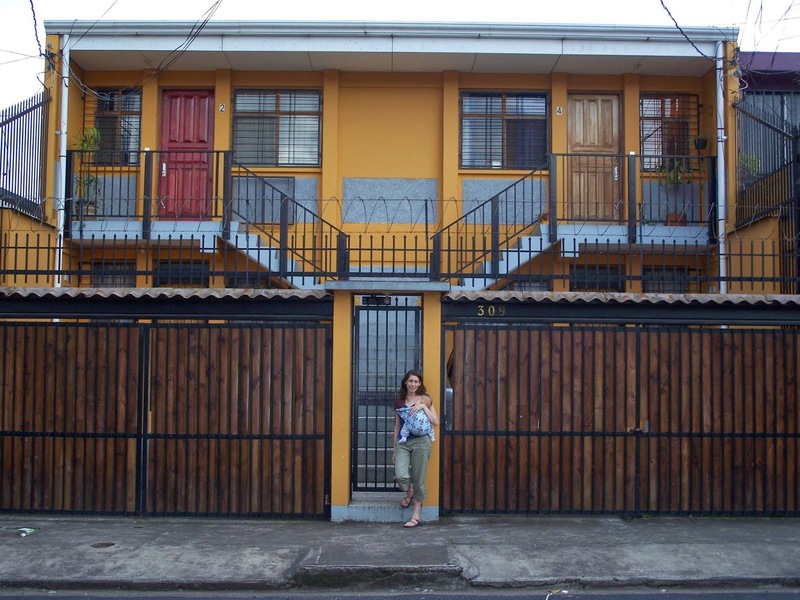 A couple of years later, God redirected us to Costa Rica, and to language school in the capital city, San José, where at first my focus was too much on the barred windows, the high concrete walls, and razor wire surrounding each building. It seemed scary, and definitely wasn't the physical beauty my heart longed for. But, again, God reminded me of Psalm 121- to lift my eyes up, not just to the hint of a mountain I could see if I stood at just the right angle on our apartment's balcony, but up further to Him who promises to watch over me. I had to choose what I was going to focus on - my overwhelming, unfamiliar surroundings, or my God who is my help. There might not always be beautiful mountains to bless our physical eyes, but we can always direct our spiritual eyes to Him. I remember a couple of years after moving out of the city to our ministry location, I found myself back in downtown San José, with our daughter in the NICU, after she was born a month early... when the country was in a state of national emergency because of flooding and landslides (that morning, a landslide had blocked the road to the hospital... but that's a story for another day!). While I stood next to her crib, I looked out the window of the NICU and panic filled me as I stared at the seemingly endless sprawl of corrugated metal roofs, trash, and run-down buildings. I couldn't see any mountains - physical or figurative - to lift my eyes to! My thoughts were quickly rushing towards fear and doubt about our decision to have our baby in a developing country. I remember God's comfort, "Lift your eyes to Me, Sarah. Your help comes from Me. I am watching over you and your baby." I wish I could say that that memorable moment was a total turning point for me, because it was so significant in my process of accepting Costa Rica as my home... but, I still struggle with letting my surroundings and circumstances govern my feelings and focus. We recently moved to a different house, and I've been feeling disoriented now that I can't see "my" mountain. But, God is working on me, reminding me that the point of lifting my eyes to the hills isn't to just to be blessed by their beauty, but to be reminded of Him who is my true strength and help. As I post this, I'm praying for all of us - that we will be women who live with eyes lifted up to our Maker, whatever our surroundings and circumstances might be! I would love to hear from you. Is it hard to move your focus off of what is difficult about your current surroundings and on to God? What has been encouraging you lately to live with eyes lifted up to Him? Thank you so much for sharing some of your story and life and for this encouragement to keep our eyes fixed on God! I really loved this post. I think one of the hardest situations in recent life for me as far as keeping my eyes focused on God was last year when my daughter was really struggling in Russian school and where our home life was dominated by impossible loads of homework. I also had a very fussy baby who took every other ounce of my strength. My life was so exhausting and everything felt like a struggle. It was hard because there wasn't any huge trial that felt so far beyond my control that I had no other choice than to look to God, but rather the trials were just long and weighty, and everything felt exhausting and hard. I struggled to find joy and knew that looking to God would not change the reality that we have these mountains of homework dominating our life. But when I did choose to look to the Lord amidst those trials, He always helped me and renewed my strength. Later on He also led us to leave Russian school, so again, He gave His help by leading us in a new and unexpected direction. I think I sometimes struggle to keep my eyes fixed on God when I know that the circumstance itself us unlikely to change. What I need to remember during those times is how His strength and joy can radically transform any circumstance. Sarah…thank you for your honesty and willingness to share! You really spoke to my heart. We are about to reach our one-year anniversary of serving in Puerto Rico and I continue to experience so many of the same emotions as you. We were given a home in a high-rise condo building and similar to your beginnings, I can see the mountains and the rainforest from my current home…not to mention the ocean! And I have felt in this first year that the Lord allowed me to live in this beautiful area high above the troubles of this island so that I could physically remove myself at the end of each day of ministry and refresh myself in His creation. But like you, I have struggled with trusting Him for my family's safety and a secure future, especially with the political corruption here. It's amazing how although His creation is a reminder of His majesty, it is also a reminder to look to Him and Him only as the provider and sustainer of our faith and as the reason why we make these life decisions that the world views as crazy. Again, thank you. I can't say enough about this post and how much it spoke to me. If you'd like, you can read more about me and my family at www.annettecortes.com.